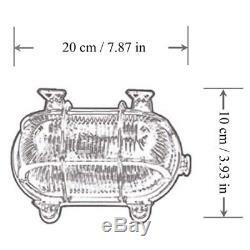 Brass Light Fixtures Strong resistance to weather conditions. Suggested place: Outdoor Lighting, Garden Lighting, Corridor Light, Bar and lounge Light, Churches Light, Hotels Light, Residential Lighting, Restaurant Lighting. Dimensions: 10cm x 20cm (3.94 x 7.87 inches). 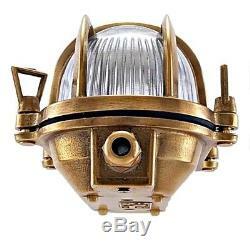 Bulkhead light made of brass This beautiful nautical brass bulkhead light fixture is based on an original that was used extensively on ships from the early 19th century onwards, due to its resistance to the harsh marine environment. A sturdy and dependable kind of wall light suitable for interior and exterior use as well as in bathrooms. This lamp provides the possibility to create a connection with the outside maritime atmosphere. Appropriate for inside or outside lighting It is made of cast-pressed brass. The degree of protection against dust and moisture is IP64. Technical Characteristics: supplied with E27 lamp holder, max 18W, transparent glass. Strong resistance to weather conditions. A proper choice for the outdoor lighting. 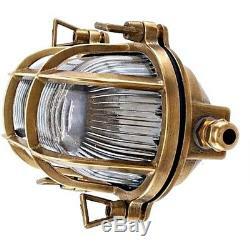 Designed to weather the wind blown sea and salt of coastal areas, to endure in humidity and dust, thus you may be rest assured that your new brass light fixture will illuminate your garden even under rainy, sunny or snowy weather. 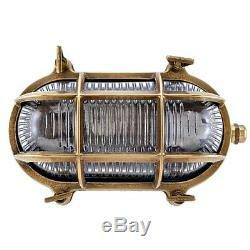 Style: Brass bulkhead wall light bronze Type: Traditional / Classic Material: Brass Glass: Transparent Shade: Bronze Length (L): 10 cm (3.94 inches) Width (W): 20 cm (7.87 inches) Height (H): cm Light bulb power: 18W Light bulb type: Energy-efficient light bulb CFL (not included) Protection IP: 64 Base: E27 x 1 Lampholder (Accepts Incandescent, LED and Compact Fluorescent Bulbs). INSTRUCTIONS FOR INSTALLATION AND PROPER OPERATION OF LIGHTING FIXTURES 1. The lighting fixtures should only be installed by an authorized and qualified electrician. Use the lamps suggested for the respective type of fixture you have chosen (as regards power and type). In case of glass breakage, replace immediately. Our philosophy is to offer simplicity and effectiveness of products that solve any need or problem of a customer. We are very confident that our product will meet and surpass your expectations, as your satisfaction is our utmost priority and goal. 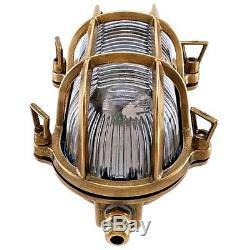 The item "Outdoor Marine Nautical Lights. Garden Lights 1x17W LED IP64" is in sale since Tuesday, April 7, 2015. This item is in the category "Home & Garden\Lamps, Lighting & Ceiling Fans\Wall Fixtures".eu" and is located in Athens, Attica. This item can be shipped worldwide.